This is my car: a Honda Element. That is the best and most attractive photo I've ever taken of it. It's not the prettiest vehicle in the world but as far as SUVs go, it isn't a bad one: decent fuel economy, the short overall length makes parallel parking easy, and I can fit comfortably in it. 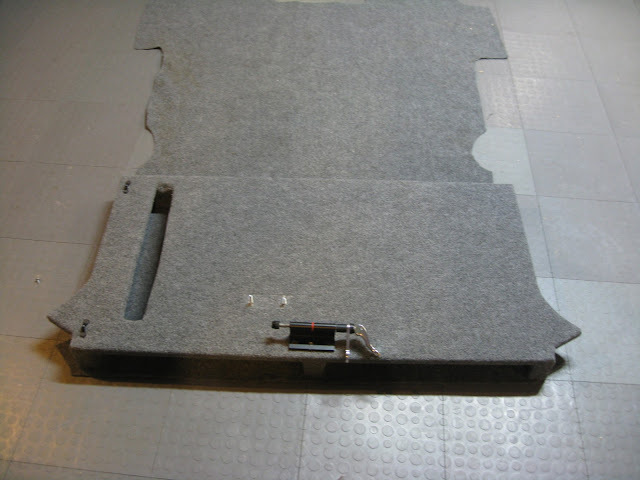 It seats four, and the two seats in the back (which are 45 pounds each) can be removed and stored which provides a cavernous space inside, which I believe is only 10 cubic feet smaller than a Hummer H2. I don't care for out-of-car rear racks because I can't open the lift gate with them on and the bikes are exposed to the elements, so I obviously wanted to build some kind of rack that would fit on the inside. My first attempt to do so was made mostly out of aluminum and just for the recumbent and my wife's Trek hybrid. It was great in that the bikes could be moved without either bike touching each other or the car, but the rack itself took up a lot of space - both in the car and out of it. Since I started buying bikes (and began building my mountain bike) I needed a different rack that would fit all kinds of bikes; not just the recumbent. ...and I ended up not liking it at all. Like the old 'recumbent only' rack, it takes up space in the car and I'd only want to keep it in if I knew I wasn't going to be carrying anything large. Not only that, but look at where the fork mount is (another goes just above it and to the left; you can see the bolts). I didn't realize it until I put the bike in and sat down in the car what I had done: by putting the fork mount 3" above the floor, the handlebars of the bike were blocking most of the Element's rear window. I didn't care for that, and after only two weeks of service, I retired the thing that had taken me an entire afternoon to make. I carried it outside and it dropped into the opening in the back of the car easily. It was all so marvelously simple, so naturally, the question became: what can I do to make this more complicated? As I mentioned, part of the problem I had with the earlier interior racks was the amount of space they take up in the car when the bikes aren't being moved. I wasn't wild about just screwing the Saris mounts into the wood. If I needed to carry something big I'd have to move them. I consulted my plastic parts sorters on the workbench, and I soon had a solution: I had a total of eight of the bolts below and these two were the most photogenic. 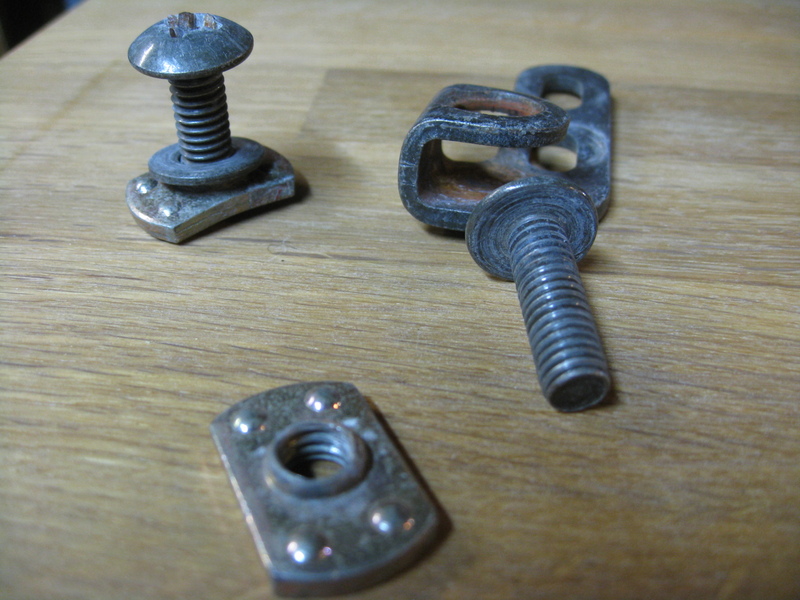 Something no other blog has posted before: these bolts have an interesting origin story: they are from the convertible black denim soft top of my Jeep Wrangler (1995 - 2006), a car I began saving for when I was sixteen that took me through 11 years, until volleyball-sized holes in the floorboards and other safety issues forced me to get rid of it. 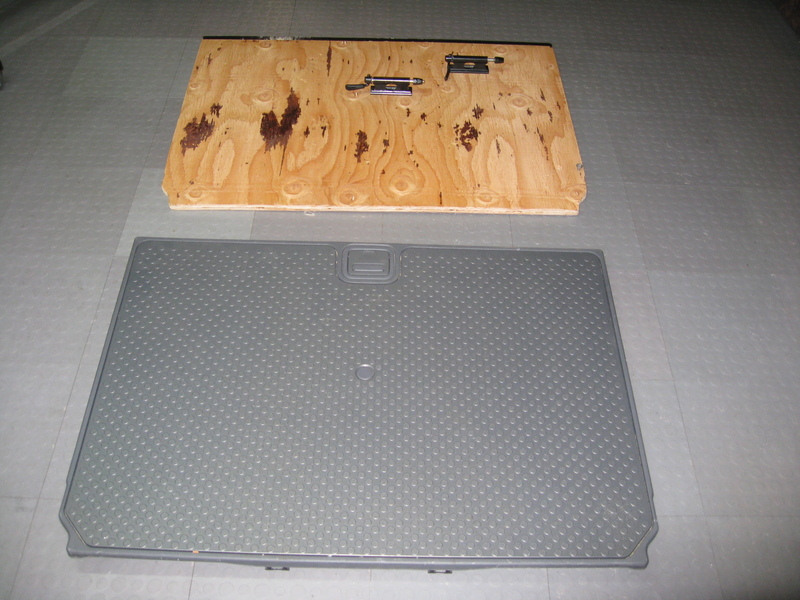 I kept some of the hardware, and I thought it would be nice to use some of the parts from the Jeep Wrangler (1995 - 2006) for this project. 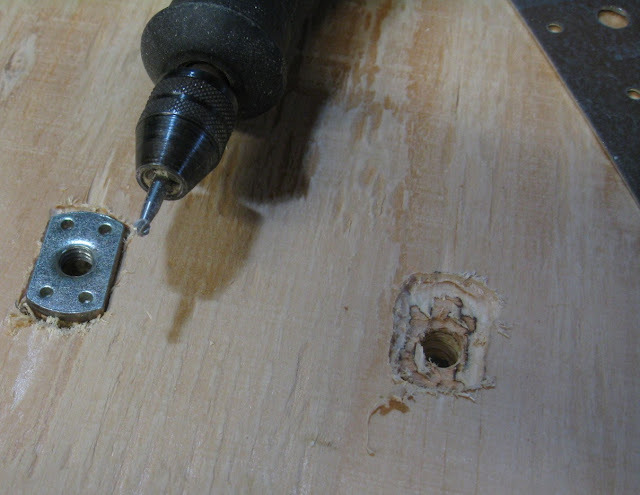 The Saris mounts weren't made for bolts that big, so I had to widen them with a drill press. That was a cakewalk. Figuring out where I wanted the mounts to go was pretty simple as well. The next part of the job was trickier: I needed to carve openings in the bottom of the plywood to fit the rectangular nuts in. The idea was, if the nuts would stay mounted in the wood, all I'd need to do if I ever wanted to remove the Saris mounts (or change the configuration if I had different kinds of bikes to carry) is just use a simple screwdriver. So I used a Dremel Rotary Tool to get the job done. I felt like some kind of lumberjack/dentist hybrid as I carefully worked the plywood to get the holes the right size. 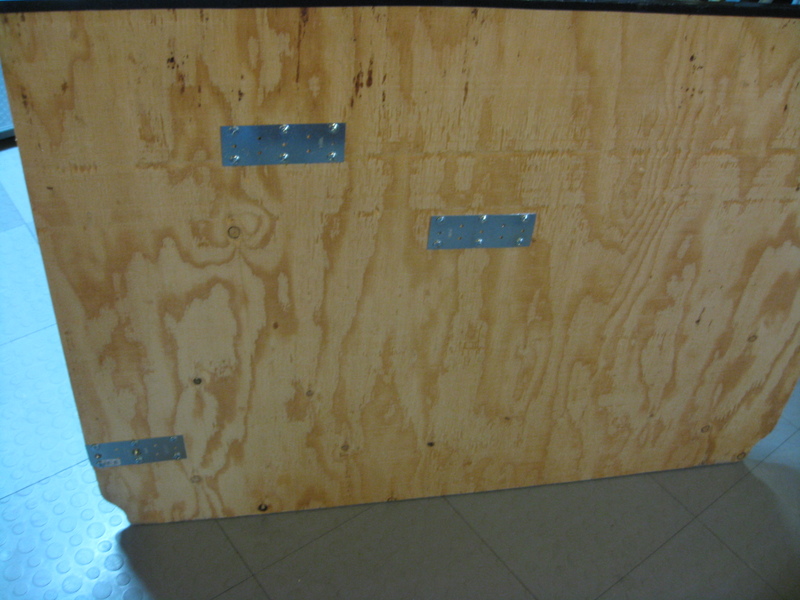 Once the rectanguler nuts fit flush into the plywood, I used some metal braces I had in a plastic box to keep them from falling out. You may have noticed this in the second photo, but I have a piece of indoor/outdoor carpet I cut to match the floor. But between the carpet and the floor I placed foam 'gym floor' material (you can also used the multi-colored 2 x 2 foam tiles found in most kids' playrooms) so when everything is put together, the Saris mounts would be even lower than normal, so though it's very easy to take them out thanks to the bolts from my Jeep Wrangler (1995 - 2006) I probably won't need to often. Here it is with my Dahon Matrix mounted in place, and the front wheel is in a special fork. I'm very happy with the rack: it doesn't bounce around when I drive, it stays secure, it takes up no space, doesn't add much weight and doesn't interfere with the rear seats when I want to put them in. 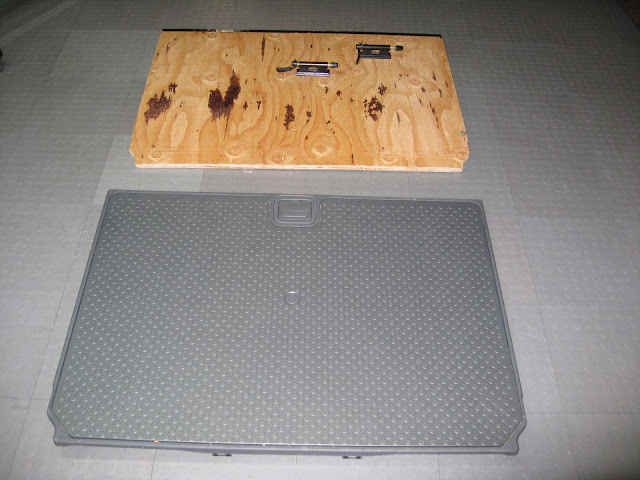 If you embark on a similar project with a Honda Element, don't get rid of the plastic floor the plywood is replacing just in case you ultimately trade-in the car to someone who doesn't do bikes. 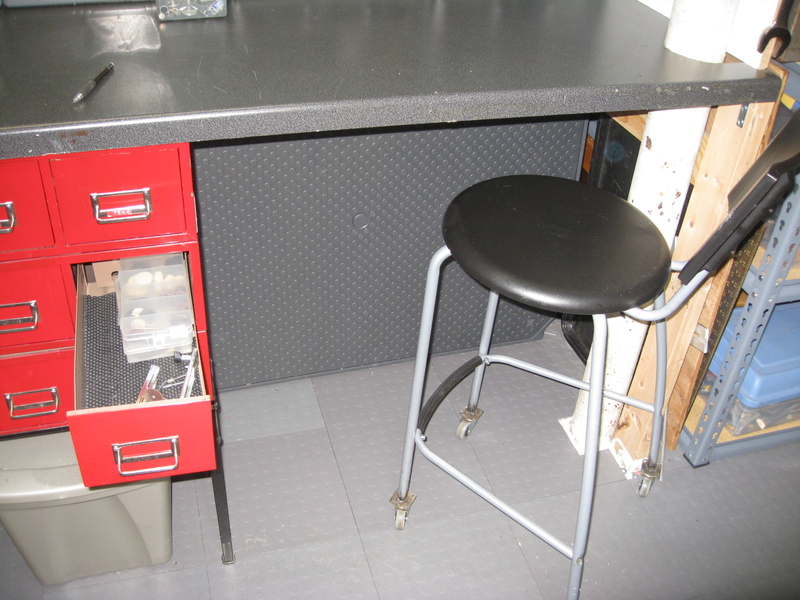 You have to store it, yes, but trust me: it makes a great toe-kick for any workbench.